Soooo... it's been 6 months since my last blog post, and I thought I'd drop in and let you all know what I've been up to. I had a big push of productivity last spring and summer, but then I crashed after Costume College and desperately needed some time to hibernate and recuperate. It's been good. I really needed a break from sewing to recharge my batteries a bit. But I haven't stopped going to costume events during this past year - I've just been rewearing older pieces from my wardrobe and giving each outfit a few tweaks to make them feel more fun. 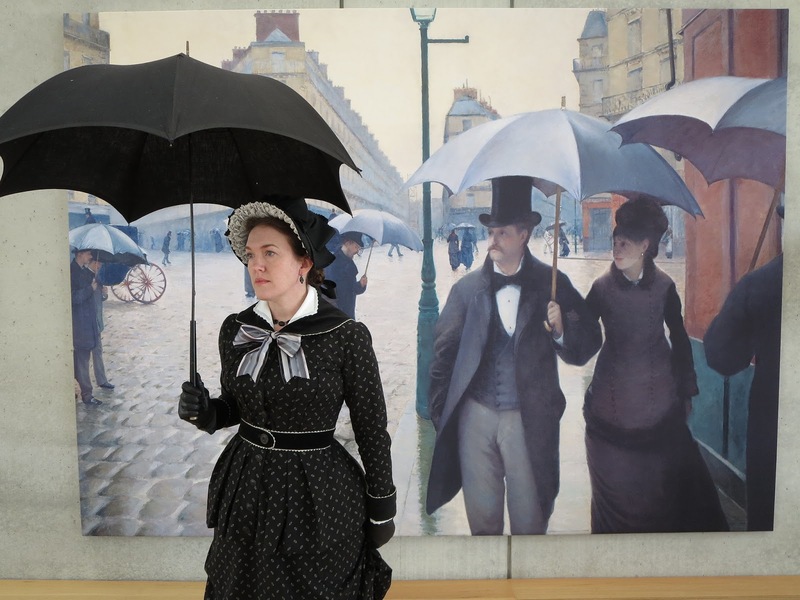 I started off last January by wearing my mourning calico to a exhibition of artwork by Gustave Caillebotte. I took this opportunity to make a new set of white collar and cuffs to finish off the dress. The inner collar and cuffs are items that you almost always see in original Victorian fashion plates and photographs, but as modern costumers, we tend to leave them off - probably because they were separate items and aren't typically included in the display of surviving Victorian garments in museums, so our eyes aren't as accustomed to seeing them there. But 19th century women used the inner collar and cuffs to protect the dress from dirt and body oils, and they could be easily removed and laundered, so it makes sense that they were essential finishing touches during the period. I ran out of time and didn't get to finish my own collar and cuffs for the first wearing of this dress at Costume College, but the dress feels SO much more complete now that I have them. 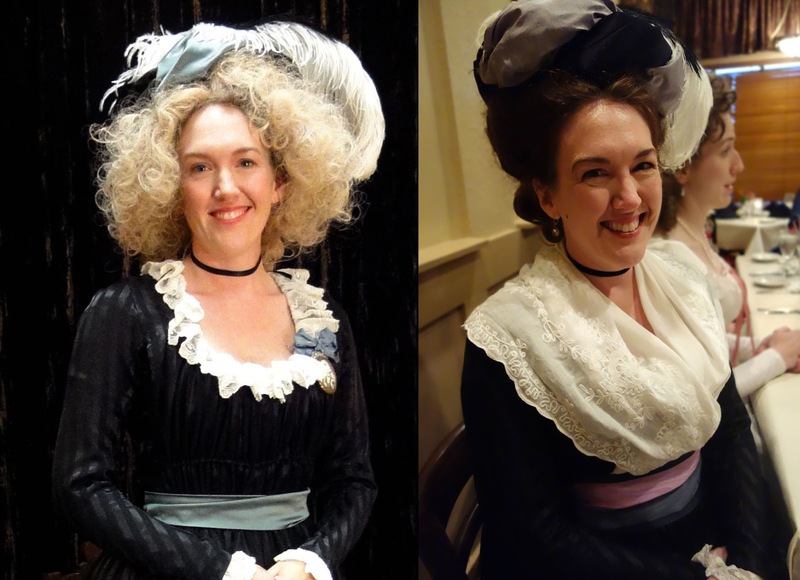 You can see the difference between the dress with and without the collar/cuffs in these pictures, and I also wore a new bow at the neckline to change things up a bit more. It's a subtle change, but I like it a lot better this way. The cuffs are just rectangular strips of cotton edged with eyelet that I tacked to the inside of the sleeves. The collar came from a mysterious little pattern on page 294 of Fashions of the Gilded Age, Vol. 2. The diagram is not labeled and there's no illustration showing what the pattern piece looks like when made up, but I suspected that it was one of those jaunty winged collars that you see so often during the natural form years. Sure enough - it worked perfectly! 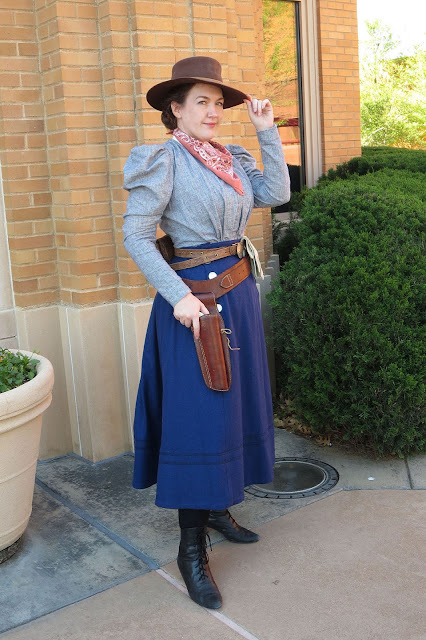 My next event was a trip to the Cowgirl Museum, so I decided to restyle my Victorian cycling outfit with some new accessories to give it more of an Old West look. This one didn't require any sewing at all, which was a wonderful treat. I just wore a different hat, a bandanna, some leather gloves, and an old belt and pouch with a turquoise brooch in the place of a buckle. I wish I could claim that the holster was mine too, but this piece was just on loan from my friend Christy for this picture. 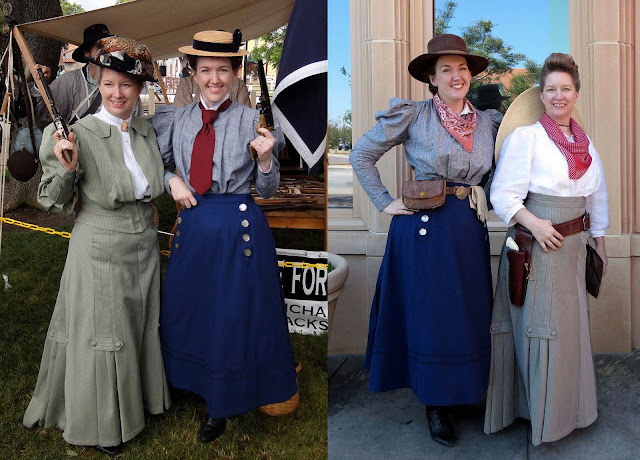 I found it amusing that Christy had also restyled one of her old dresses to give it a cowgirl vibe, and we happened to have worn these outfits together at another event 4 years ago. Even when we were supposed to be proper ladies, we still couldn't resist pretending to be outlaws! I guess it just runs in our Texas blood. I have a bad habit of wanting to make new costumes for EVERY event that I go to, but this year has made me grateful to have some good pieces in my wardrobe that I can rework and rewear in different ways. Plus, I've really enjoyed focusing on the stress-free fun of wearing costumes vs. the often exhausting process of making them. I have to admit that I'm itching to make some new things again, and I've already started one big project that I'll be sharing here soon. But hopefully I'll be able to stay a little more balanced with my work load in the future, and I think this sewing hiatus has taught me to appreciate my older costumes a lot more than I used to. 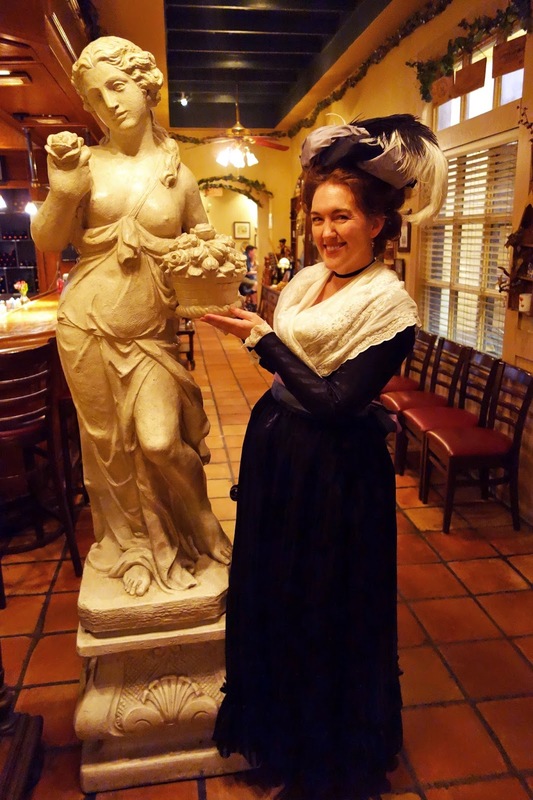 BTW - if you'd like to see more pics from my recent costumed adventures, feel free to check out my flickr. Even when I'm not blogging, flickr is one place that always stays updated because I like to share my pics with my wonderful friends in the DFWCG. And if you happen to be in the area - come out and join us! 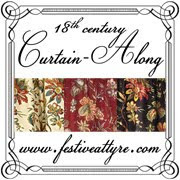 We'll be adding a bunch of new events to our calendar over the next week! Love to hear from you again! And there is nothing bad about rewearing, actually most clothes are intended to be worn several times! The Cowgirl outfit is especially amazing for me! Good to hear from you again. I love the look of your mourning calico with the white cuffs! and the photos are all clever and amazing. I love the cowgirl outfit! Well, I love all of them :) I've been on quite a sewing hiatus myself, so this inspires me to get back stitching. And it's nice to see other costumer take time off, too, sometimes. I feel less guilty! Thanks for sharing! 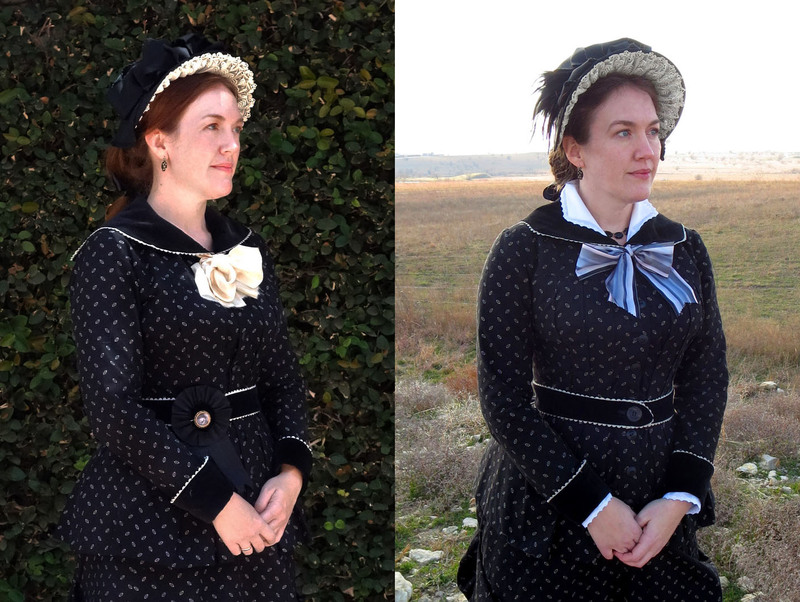 The mourning dress looks so different with the collar and bow. It's lovely! I love the black chemise too. Oh Jen! I LOVED "the crazy blonde mess" and I bet Marie Antoinette would have also!